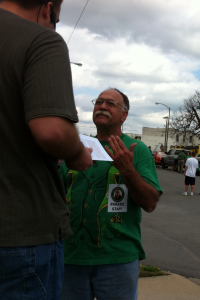 Saturday March 17, 2012 several of us went to the Springfield St. Patrick’s Day Parade to share the Gospel with people. The game plan was to get there early so that we could preach to the crowds who were setting up for the parade and then walk the parade route and give out Gospel tracts. When the preaching began we immediately encountered resistance. The event staff did not want us to be there telling us that we were not going to have any kind of religious meeting. 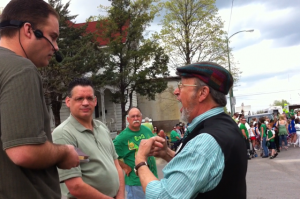 I explained to the staff person that since this was the St. Patrick’s Day parade I simply wanted to begin with sharing some history on the life story of St. Patrick. During the preaching the crowds became hostile some were calling us names and one person tried to kick the stool out from under me. Despite the difficult time preaching the tract distribution along the parade route went great with several thousand people receiving tracts. St. Patrick was a missionary to Ireland who was born in 373 A.D., along the banks of the River Clyde in what is now called Scotland. His father was a deacon, and his grandfather a priest. At that time the Scotland area was tormented by Irish pirates who would sweep into the villages, pillage and burn the houses, and then kidnap the children. When Patrick was about 16, raiders descended on his home town. His house was burned and when one of the pirates spotted him hiding in the bushes he was seized. The pirates hauled Patrick aboard a ship and took him to Ireland where he was sold into slavery. Shortly thereafter, in vivid dreams, Patrick sensed the Lord telling him, “See, your ship is ready.” Mounting a daring escape, Patrick traveled many miles afoot to a harbor where, at the last moment, he jumped aboard a ship. He eventually arrived back home to Scotland, where his overjoyed family begged him to never leave again. When God saves someone through the Gospel it changes a person so that they now see the world in a completely different way. They now have a love for other people which flows from a love for the Savior. This love compels us believers to want to share the Gospel with others so that they too might come to a saving faith in the Lord. This is what happened to Patrick, he couldn’t get his mind off of his Irish captors. One night, in a dream Patrick dreamt of an Irish man who begged him to come evangelize Ireland. It wasn’t an easy decision, but Patrick, about 30 years of age, packed up, said his good-byes, and returned back to Ireland with only one book tucked under his arm, the Bible. As he evangelized the countryside, multitudes came to listen. The superstitious Druids constantly opposed him, and he repeatedly narrowly escaped assassination plots. Despite these difficult hostile circumstances the Lord was with him and his preaching was powerful. The Lord caused thousands to be converted through the Word as he preached and many new churches were established. The most fitting thing we can do to honor St. Patrick on St. Patrick ’s Day is to do what he would of done when he saw a large Irish crowd and that is to preach the good news of the Gospel. So that’s what we did this March 17, 2012 at the Springfield St. Patrick Day Parade. The crowd was hostile but the Gospel went out. After explaining sin and it consequences, we told them of the saving work of Jesus Christ on the cross. We pleaded with people to come and be reconciled to the Lord Jesus Christ but they did not want to hear it. It pains me to see people reject the free saving gift of the Gospel but the results are not up to us but to God and we simply trust in His Word. This entry was posted in Evangelism and tagged 2012, Apostle to Ireland, Bible, church, Good News, Gospel, Ireland, Missionary, Missouri, Mo, preach, preaching, Saint Patrick, Scotland, Springfield, Springfield St. Patrick's Day Parade, St. Patrick, tracts. Bookmark the permalink.